Extreame Savings Item! Save 49% on the US Sense Electronics Organizer Case Bag, Travel Gear Management Organizer for Electronics Accessories Tools Cables Cosmetics Personal Care Kit with Sleeve Bag for iPad (Black) by US Sense at Pear Farm. MPN: USFR011. Hurry! Limited time offer. Offer valid only while supplies last. ❤ PRODUCT DIMENSION:8.9*12.2*0.9 inch; This organizer bag ideal for Designed for all kinds of organizing purposes: tools, electrics accessories, cosmetic brushes, personal care stuff .Include 5 pcs Fastening Cable Ties as a gift ! ❤ DOUBLE SIDE STORAGE: Criss-cross rubberized woven elastic bands secure the gadgets firmly in place; Practical design provides great flexibility for organising your accessories . 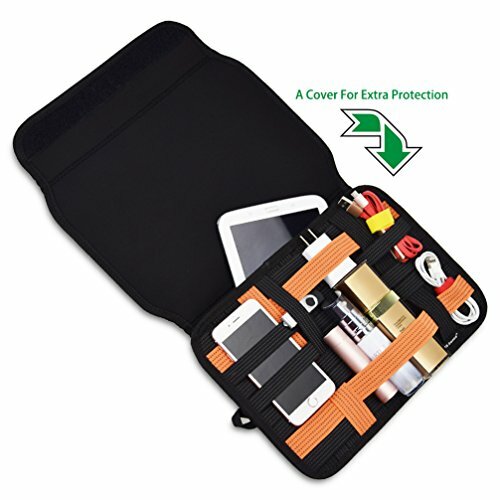 ❤ EXTRA PROTECTION DESIGN:Neoprene cover protects items from scratches, dust and accidental dropping.Save space with its slim profile, easily fit into your backpack or handbags. ❤ ANTI-SLIP ELASTIC WOVEN: Super strong elastic force and crossed woven design can hold gadgets firmly in place. No worries for gadgets falling off. With built-in PE board, this elastic organizer is strong enough and not easy to bend. If you have any questions about this product by US Sense, contact us by completing and submitting the form below. If you are looking for a specif part number, please include it with your message.